Every staff meeting that takes place in an organization is valuable. They are important because the most crucial decisions in favor of the organization are taken in these meetings. 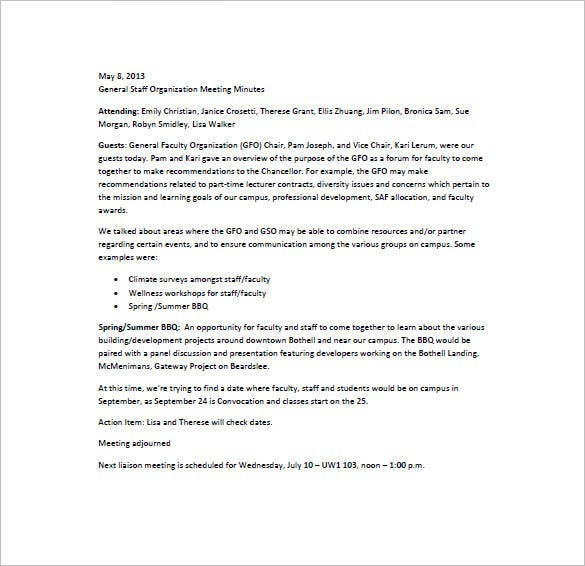 Staff meetings are a commonplace affair in almost all organizations including academic institutions, hospitals, and business houses. Their importance in the smooth functioning of an organization can never be overemphasized. While they are vital for the overall growth of the organization, their materialization can be incredibly painstaking. A lot of people’s efforts go into holding a staff meeting successfully. And the individual responsible for documenting the entire meeting does the most challenging job. 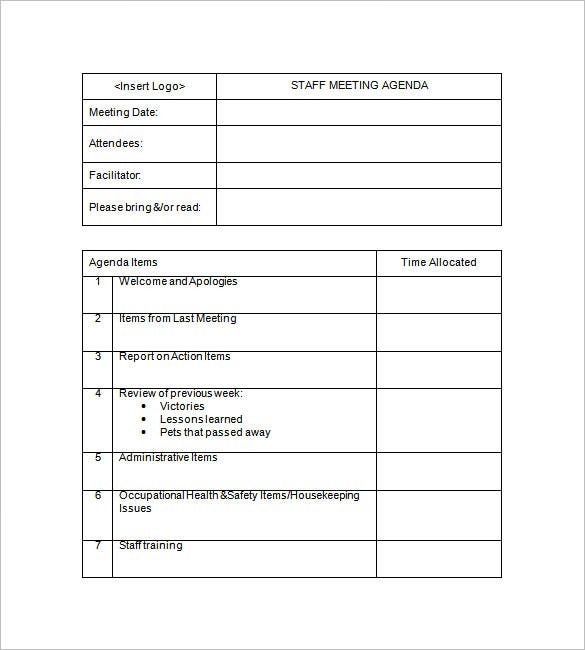 The good news is, this job can be made easier with the Staff Meeting Minutes Templates. 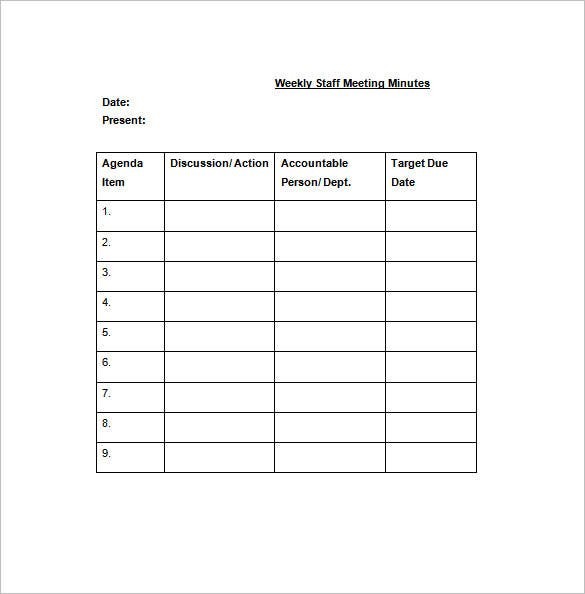 You may also see Project Meeting Minutes Template. 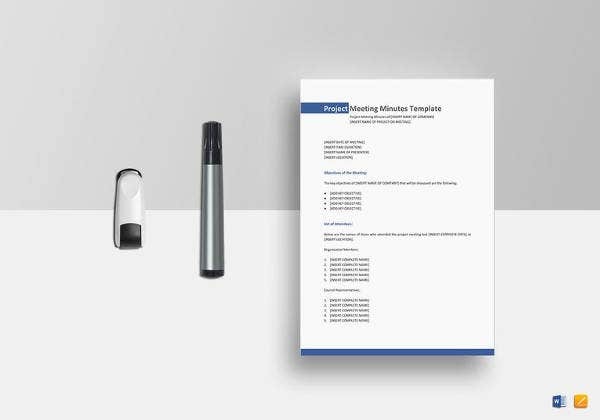 The most perfect way to record all the details of any staff meeting; this new and free PDF doc has provisions to include time, topic and names of presenters during an ongoing meeting. 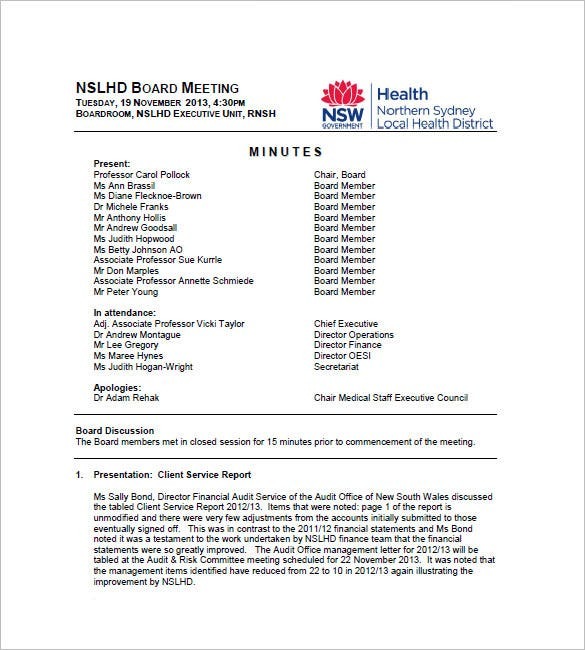 nslhd.health.nsw.gov.au | People associated with health care need no introduction to staff meetings. They regularly participate in such meetings to discuss the achievements and setbacks of the hospitals they are a part of. Medical staff meetings are also important for patients who seek better health care. 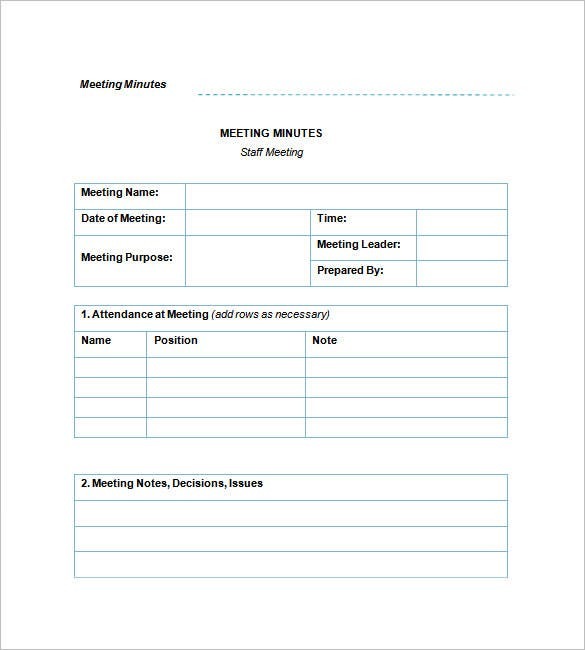 These meetings are aided in a major way by Medical Staff Meeting Minutes Templates and should invariably be made of use. 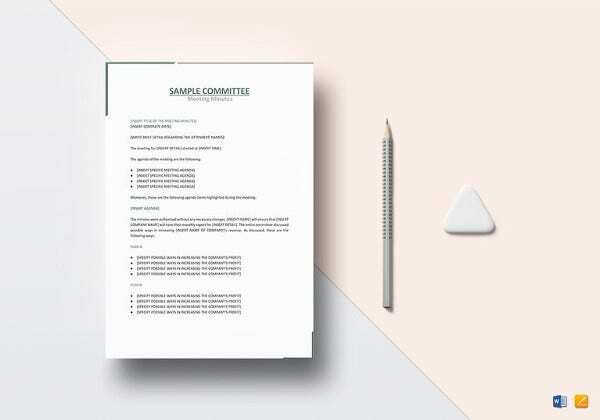 vhitrec.org | This sample PDF doc comes with ready to use Agenda Template and a Minute Template as well. This can also be converted into a Word Doc for any further editing and the printed. 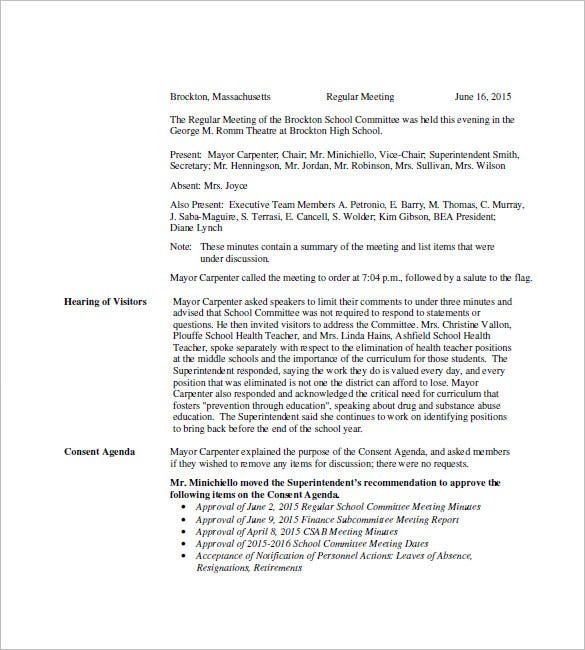 brocktonpublicschools.com | Staff meetings are an inevitable part of any school. And the schools that don’t pay due importance to these meetings lag behind in the race of being the best. And that is why; it should be the responsibility of the meeting management team to keep every detail of the meeting in track. 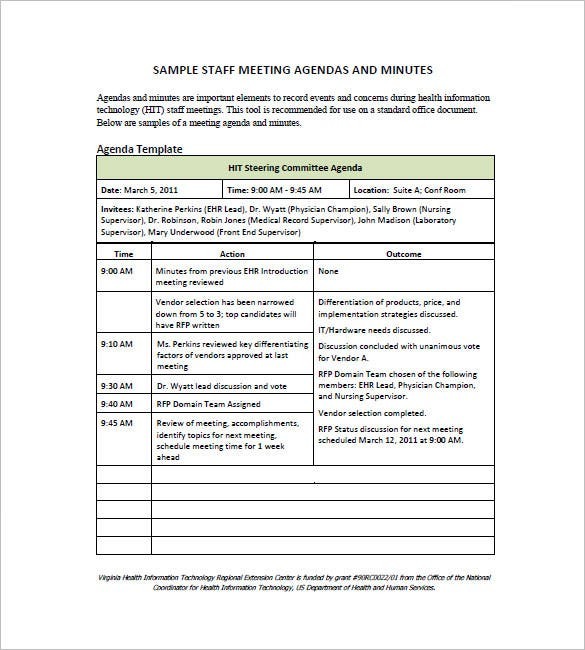 While there are many ways to do so, smart people prefer to use School Staff Meeting Minutes Templates. 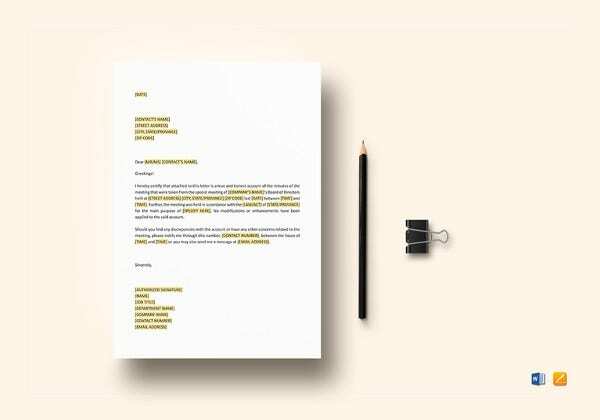 These templates are not only handy but also extremely useful. 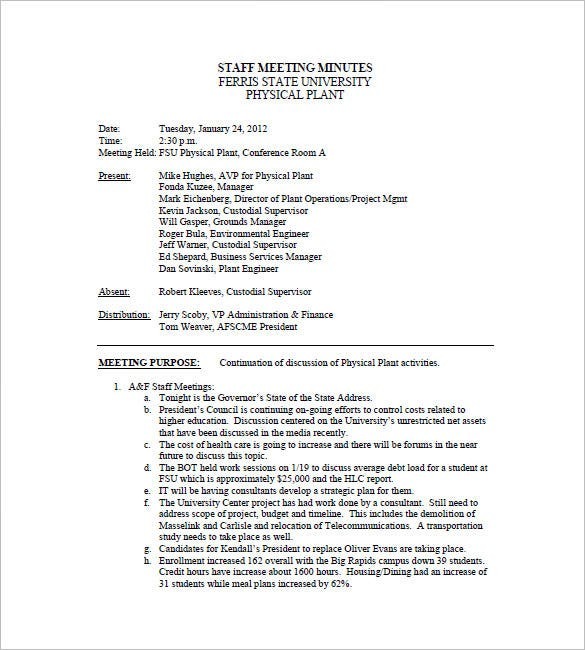 ferris.edu | Ideal for Universities and Colleges, this Minutes of Meeting Template for Staff members includes meeting purpose, member details, motion status etc. It also has fully constructed declarations to conclude the Minutes. 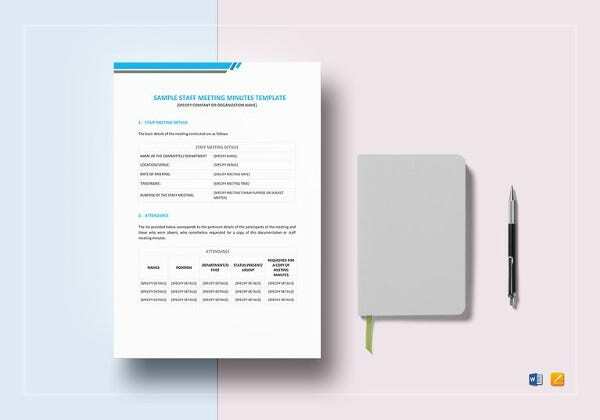 This word doc has incorporated Excel tables for an organized look and better management of data. 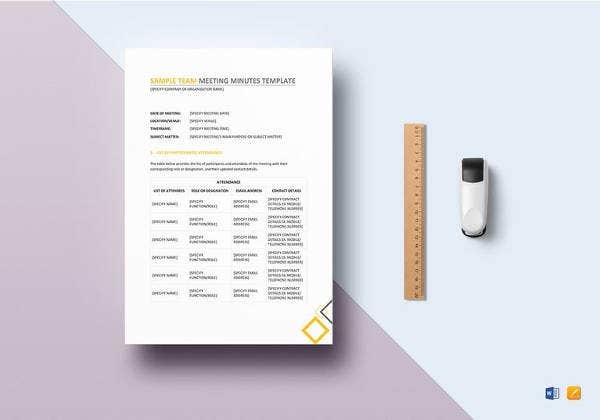 From logo to member details, everything can be recorded during an important staff meeting. bostonpublicschools.org Although, different kinds of meetings take place in the premises of a school, the kind that holds special importance involves teaching staff. Teaching staff meetings are generally held by a school to discuss issues regarding its curriculum and the overall progress of the students. And that is why it’s important for the school authority to leave no stone unturned to ensure successful materialization of these meetings. 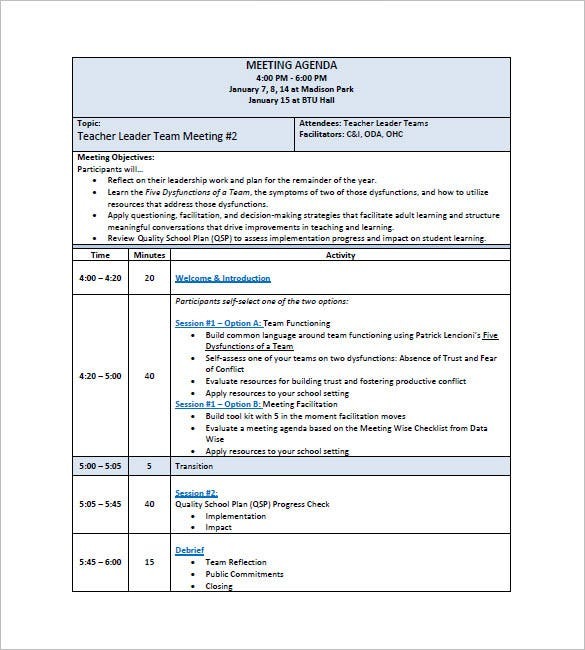 For best results, Teaching Staff Meeting Minutes Templates may be used. Writing minutes is not a cup of tea for everyone. The person operating should write it accurately making it clear to the staff members about the goal of the meeting. 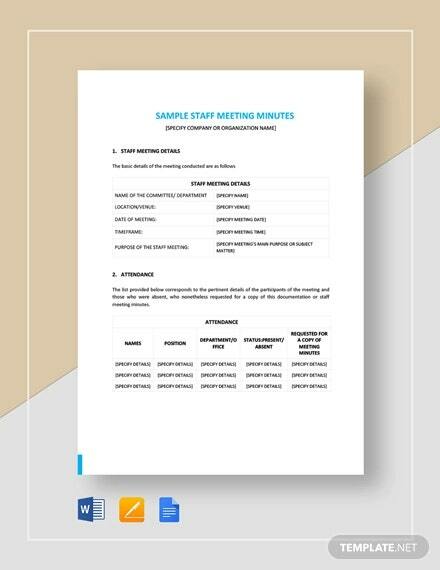 Minutes Word and Excel templates are also helpful in letting the new recruitments know about the present conditions of the organization and also we provide meeting minutes template. Who benefits the most from these templates? 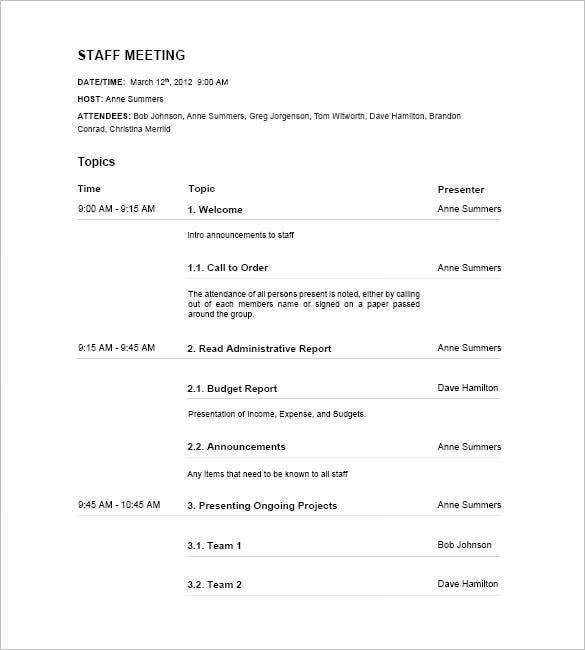 Staff meeting minutes templates undeniably aid smooth functioning of staff meetings. But the kind of organizations that reaps the biggest benefits is startups. Most startups remain clueless as to how to minimize unnecessary efforts that generally go into making a staff meeting happen. And that is why they fondly make use of templates. 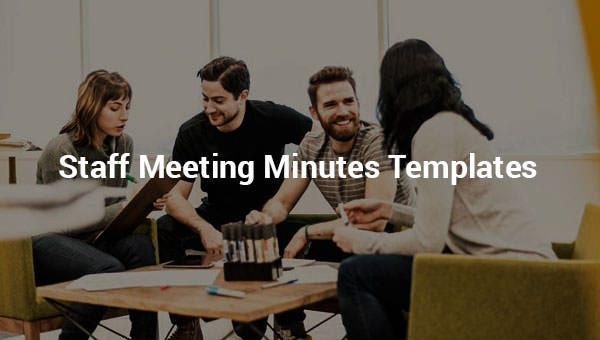 Templates help them effectively keep track of every meeting minute. As a result, they are able to hold and manage staff meetings with less effort. 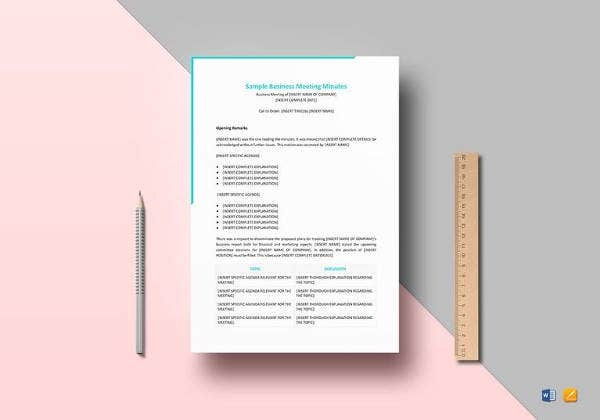 If you run a startup and are keen on organizing regular staff meetings then here is what you need for their hassle-free materialization- staff meeting minutes templates. 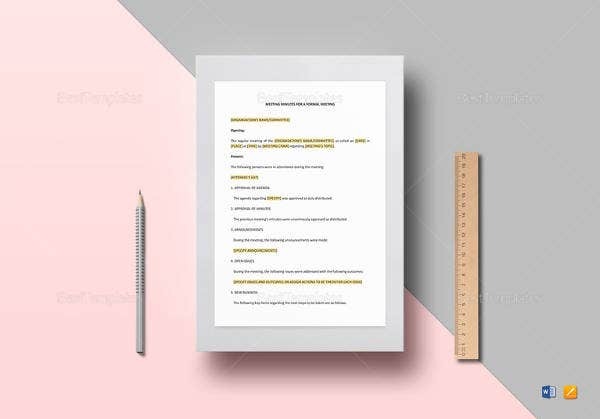 Download amazing templates from trusted online sources. There are plenty of websites that have free templates on offer for their customers. You can opt for them if cost-effectiveness is all that you want. If you want more sophisticated designs, you will probably have to shell out some cash. Nevertheless, all templates are going to make your experience of meeting minutes documenting, pleasant. If you have any DMCA issues on this post, please contact us!